ATTRACTIONS & EVENTS The community has invested to achieve a revitalized Main Street, which often hosts parties throughout the year including the July 1 Street Festival with international performers. You can also join them for Agri-Days in August, and take in the December Christmas Extravaganza and frosty parade. The Town of Mundare is just a 45 minute drive east of Edmonton, easily accessible from the Yellowhead Highway. It's a great day trip destination, and also a great place to live. History buffs will enjoy the Basilian Fathers Museum, a world class facility with an intriguing collection of artifacts and history that attracts over 5000 visitors a year. For those looking for KNO W physical activities, there is a hockey arena, a curling rink, and a bowling alley in town. 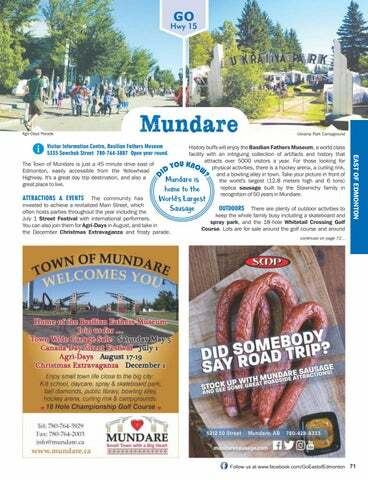 Take your picture in front of the world's largest (12.8 meters high and 6 tons) replica sausage built by the Stawnichy family in recognition of 50 years in Mundare. Visitor Information Centre, Basilian Fathers Museum 5335 Sawchuk Street 780-764-3887 Open year round.